Today in Masonic History John Blair Jr. passes away in 1800. John Blair Jr. was an American jurist and founding father. Blair was born in Williamsburg, Virginia on April 17th, 1732. He was from a prominent Virginia family. His father John Sr. was acting Royal Governor for a period of time. Blair's uncle James was the founder and first president of the College of William and Mary. Blair attended William and Mary where he graduated with a Bachelor of Arts degree in 1754. The following year he traveled to London where he studied law at the Middle Temple, one of the four Inns of Court exclusively entitled to call their members to the English Bar as barristers. After passing the bar, Blair returned home to Virginia where he began to practice law. He was quickly thrown into public life when he won an election to fill the seat reserved for the College of William and Mary in the House of Burgesses. He served in that position from 1766 to 1770. From 1770 to 1775 he served as the clerk of the Royal Governor's Council. As the American Revolution approached, Blair sided on the patriot cause, with the moderates. He felt that Patrick Henry's extremist resolutions against the Stamp Act went to far. He quickly changed his mind when the British Parliament dissolved the House of Burgesses. In 1770 and 1774, Blair joined George Washington and others in signing an agreement stating that they would not import any more British goods until taxes were repealed. It was in 1774 that he also began calling for the creation of the Continental Congress after the Intolerable Acts were passed. After the American Revolution began, Blair was very active in the Virginia state government. He helped to draft Virginia's constitution. Later he was on the committee that created Virginia's Declaration of Rights. Between 1776 and 1780, Blair was appointed to various judicial positions. Because of this he was automatically on the Virginia Court of Appeals which put him in the position to hear the case of Virginia v. Caton et al., which was a precursor to the case Marbury v. Madison. Marbury v. Madison forms the basis for the exercise of judicial review in the United States under Article III of the Constitution. In 1786, Blair was appointed as Thomas Jefferson's successor on a committee revising Virginia's laws. It was around this time that Blair while riding in a carriage with George Washington the two men almost fell from a bridge into a flooded river. They were returning from a convention for Virginia laws when one of there horses broke through the wooden bridge and almost tossed the two men into the river below. In 1789, Washington appointed Blair to the United States Supreme Court. Blair only heard 13 cases in his 6 years on the high court. The most significant was Chisholm v. Georgia. In the case, Chisholm was suing the state of Georgia on behalf of an estate he was the executor for. 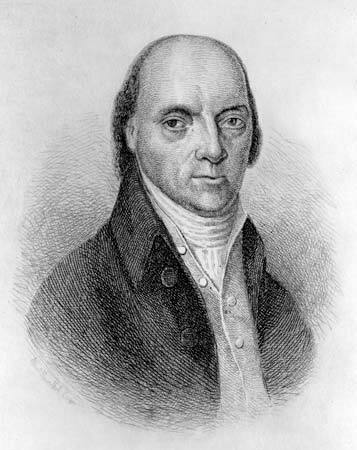 Chisholm alleged that the state of Georgia did not pay for supplies provided during the American Revolution. The court ruled in favor of Chisholm after the state of Georgia refused to appear in court. This case is significant because it led to the passing of eleventh amendment of the Untied States Constitution with deals with a states sovereign immunity. Blair passes away on August 31st, 1800. Blair was a member of Williamsburg Lodge No. 6. Williamsburg Lodge was one of the original lodges that formed the Grand Lodge of Virginia in 1777. That same year Blair was elected as the First Grand Master of the Grand Lodge of Virginia. The position was originally offered to George Washington, he declined because of his duties leading the Continental Army.